YA paranormal romances can be so disappointing. Most of what I've read recently has followed the same boring trends. Girl falls in love with boy. Girl is a Mary Sue and/or damsel in distress with no personality. Boy is shrouded in mystery and ignores the girl because he is "different" and doesn't want to "hurt" the girl. There is usually another boy thrown in there to add a plot and a little bit of angst. So on and so forth. You get the picture. We've all read it before and I've recently turned away from these books because I'm tired of reading the same thing over and over again. 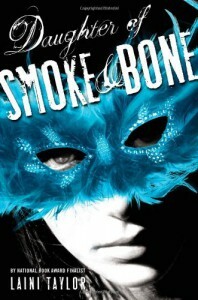 However, I kept seeing Daughter of Smoke and Bone pop up everywhere on Goodreads. It was getting stellar reviews by people who are quick to tell you if they disliked a book, and I have to agree with the praise. I loved Daughter of Smoke and Bone. 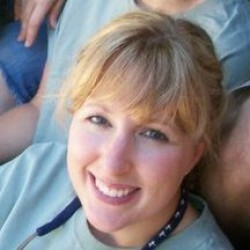 First and foremost, Laini Taylor has created a fantastic world for her characters. A world of angels and demons that is very unusual from the normal lore we are used to reading about. A world that has been at war for centuries. Here enters our heroine, Karou. She is a human orphan girl that has been raised by four demons. Karou runs errands for the demons in the human world. On one of her errands she runs into an angel that tries to kill her. From there the plot unfolds into a very exciting, dark, and unusual angel and demon story. Finally, the part of this story I loved the most was that the plot was not entirely focused on the romance. It's a huge part, but it's not the ONLY part. There are strong statements about family, loyalty to civilization, and the power that certain civilizations can have over others that are weaker. As you can see this is not your typical paranormal story. It runs deeper than that. I cannot wait to read the sequel and i would highly recommend the Daughter of Smoke and Bone.